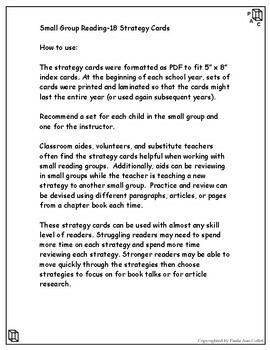 Teachers, classroom aides, volunteers, and substitute teachers find the strategy cards helpful when working with small reading groups. Additionally, aids can be reviewing a strategy(s) in small groups while the teacher is teaching a new or different strategy to another small group. 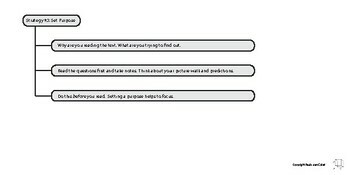 Practice and review can be devised using different paragraphs, articles, or pages from a chapter book each time. 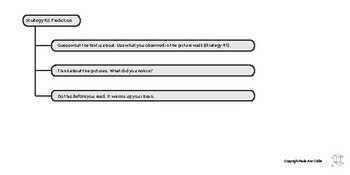 These strategy cards can be used with almost any skill level of readers. Struggling readers may need to spend more time on each strategy and spend more time reviewing each strategy. 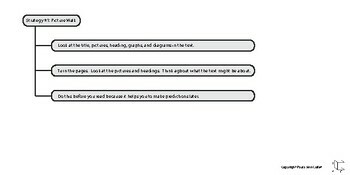 Stronger readers may be able to move quickly through the strategies then choose strategies to focus on for book talks or for article research.